I tested a pair of size 10 1/2 Meindl Vakuum GTX Walking Boots in the Lake District on one of my regular walks - this time up onto the Scafell Pike plateau to visit England's highest point. This walk from Eskdale included several miles along rough and stony tracks followed by short but very steep grass and then an easy scramble across rocky terrain on to the summit itself. As it was Spring time I was carrying a relatively light daypack. The Goretex lining meant that whilst my feet did tend to get quite hot at times they stayed dry and really very comfortable throughout the day. These boots are also cut relatively high which I thought was going to be a problem when I first tried them on in the office - but out in the hills this proved to be unfounded. The Meindl Vakuum GTX Walking Boots have a nice solid toe box and a good degree of stiffness in the sole so the support and protection provided to my foot and ankle was very good even on the rockier sections of the walk. The grip on all the terrains I encountered was also reassuring. The two zone lacing system enabled me to get the right fit at my toes and around my upper foot, ankle and heel which is important. The support both longitudinally and laterally was very good and the boot fits relatively high up around the ankle so walking over relatively rocky ground was not a problem. Traction on rocky paths, mud and wet grass was also excellent. Whilst I'd never recommend that anyone actually set out on a day's walking with completely brand new boots, these boots really were very, very comfortable straight out of the box. I have no doubt they will be for many miles to come. As with the women's version - these are a fine pair of boots from a manufacturer with a long tradition of quality boot making. 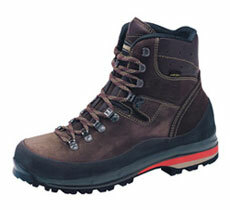 The range of features in what is a relatively light boot is very impressive. Meindl don't officially categorise these as being for use with crampons but we think they could be used with flexible crampons for short periods of time. The Goretex lining means that they're probably warm enough to be used all through the year and features such as the hand-wrapped rubber rand and quality stitching mean the the durability should be good. So if you walk in higher UK mountains such as The Lake District, Snowdonia and Scotland during the spring, summer and autumn months then the Meindl Vakuum GTX Walking Boots are certainly worthy of serious consideration. They are relatively expensive - but if you are a regular walker having to replace some old friends make sure you dip your toe into a pair of these.